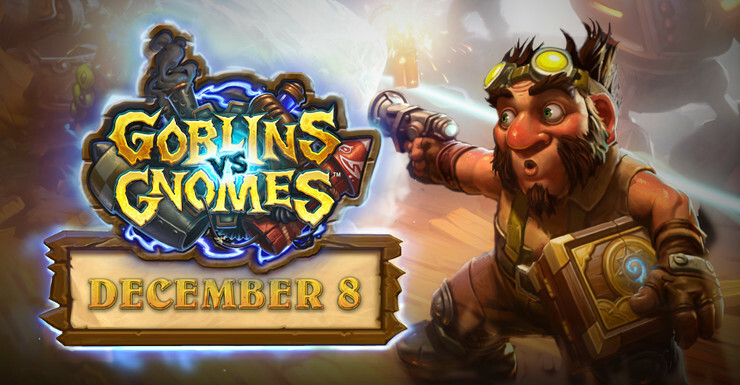 Hype has been slowly building for Goblins Vs Gnomes, the first large expansion for Blizzard's online collectable card game Hearthstone: Heroes Of Warcraft. Since its official unveiling at BlizzCon 2015 cards from the set have been released through a teasers and tasters given to fan sites, cards which have revealed a heavy focus on Mechanical minions and devices, with a liberal amount of humour for good measure. Yesterday the entire set was officially revealed, along with a concrete release date: December 8th (or 9th in the UK/EU). - No up-front cost for the GvG expansion, cards are acquired via microtransactions. - GvG Card Packs are purchasable alongside vanilla expert card packs for cash or in-game Gold. - There has been no information on any cost differences between these pack types. - GvG Card Packs replace vanilla packs as rewards from the Arena. - GvG exclusive cards are craftable from Dust. - GvG cards will also appear as potential draft picks in the arena, whether or not you have them in your personal collection. Fan site Hearthpwn has already datamined rewards for pre-launch and launch events, crediting you with three free packs and an Arena entry ticket. Those who pick up the game on Android (when released on that platform) will also be granted a free pack for their collection. For more information on the game visit PlayHearthstone.com. Hearthstone: Heroes Of Warcraft is available for Windows, Mac, iPad and is coming soon to Android tablets.